Hekab Be Biblioteca ~ Open Road Community Library: Happy New Year 2008! Here are some photos from yet another successful Hekab Be Christmas Party!! 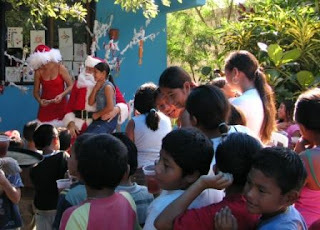 Many thanks to everyone who helped and sent gifts to make a delightful Christmas for the children of Akumal. One last 'customer' for Santa! The kids had decorated everything with old fashioned do-it-yourself decorations - Remember those construction paper chains -- they were everywhere! Along with Feliz Navidad signs, holiday paintings, and a sweet Christmas "tree" made out of twigs wrapped in cotton and hung with hand-made ornaments. Anyways, with lots of ho, ho, ho's and Feliz Navidad's, and kids going nuts, the party really began. Carlos tried to herd the kids into 2 lines of boys and girls under 8. It was a bit like herding cats, but eventually there were neat lines of boys and girls. They really were amazingly obedient and waited their turn, with sparkly eyes as they watched those in front of them get a toy. Each sat on Santa's lap, had his photo taken, and got a present. The littlest ones were a bit scared of Santa. But Santa was a trooper and carried on. As the children got older, there was a real look of wonder and excitement in their eyes as they sat on Santa's lap and each got a hug, a kiss, and a present! Next came the older girls and boys, 8-14. It was funny to watch the older boys who definitely wanted a present, but did NOT want to appear like "babies" sitting on Santa's lap. They stood next to Santa and crossed their hands over their chest in a very macho pose for the photo, and then resorted to little boys again as they couldn't wait to get their presents. Ok, someone asked if they had ever seen the library kids use their donations. Well, here's an update. Each kid got a toy and candy and a fun meal and a seat on Santa's lap. Thanks to locogringos and others, I saw lots of dolls, baby dolls, and fashion dolls, and little ponies with long hair, and paint sets, for the girls. For the boys, I saw one little boy who got a yellow dump truck. I asked him if he liked it or if he wanted to trade with someone else. He said no way would he trade because he loved the truck! What a happy face. My personal favorite was the Superman "doll" complete with cape that was made to "fly" everywhere. There were lots more toys and backpacks and stuff, but those are the ones I remember most. Maggie, and I and some of the moms were busy handing out food and drinks, while the kids ate and ran around like crazy. What silly fun! Turtle Bay Bakery donated two huge and gorgeous cakes, decorated with real red hibiscus flowers. The moms and kids gobbled them up, and of course the older boys managed to sneak seconds or maybe thirds -- which was ok but we had to wait until everybody had firsts! Hmm -- boys are boys everywhere. Oh, and not only did the library look great, but the kids looked great too. I remember after 9/11 when tourism was down, the kids looked raggedy with mismatched clothes and only the cheapest flipflops. Now some of the kids wore fancy sandals or sneakers, most wore matching nice clothing, some of the girls had gold earrings and ribbons in their hair. They looked so cute. (Ok, I am a wannabe grandma, so most kids look cute to me.) Also, at the party in 2001, most of the children did not open their presents. They wanted to save them to open at home on Christmas because they knew there probably would not be any others. this year, with a bit more prosperity, the kids ripped open those presents with glee! I loved it. Special thanks to Alice & Chuck, too, for their Xmas gift to HB, a new 6 volume set of children's encyclopedias!